Welcome to the Potomac home inspections section. ADVANCED PRO INSPECTIONS (API) is ready to complete your detailed home inspection in Potomac using the latest technology for inspecting home. If you have any questions about home inspections or thermal imaging API is here for you. Owner Terry Ewald is a home inspector certified by the International Association of Certified Home Inspectors (InterNACHI), the world's elite, non-profit inspection association. Additionally, we offer FREE state of the art thermal imaging along with all our home inspections to give you a complete and thorough home inspection for your money. Our goal is to offer the best possible home inspection in the Potomac area. City of Potomac web site: http://connect2maryland. Potomac is a census-designated place in Montgomery County, Maryland, United States, named for the nearby Potomac River. In 2013, CNNMoney.com listed Potomac as the most affluent town in all the United States based on median house income. Potomac is also the seventh most top-educated American small town according to Forbes. In addition, Bloomberg Businessweek labeled Potomac as the twenty-ninth richest zip code in all of the United States in 2011 and had the largest population of any U.S. town to have a median income of more than $240,000. It is also tied with three other zip codes (all within the Upper West Side or Upper East Side of Manhattan) for the greatest concentration of the "1 percent" in America. Many Potomac residents work in nearby Washington, D.C. The land which is now Potomac Village was first settled by Edward Offutt in 1714 after he was granted a 600-acre (2.4 km2) land grant "Clewerwell" by Lord Baltimore. His grant of land was by the Tehogee Indian Trail, an Indian trade route built by the Canaze Indian nation in 1716. Throughout the 18th century, what became known as Offutts Crossroads was a small, rural community which served planters and travelers. In the 19th century, a few small dwellings had been built along with a tavern established in 1820. By the time of the Civil War, the community contained two general stores, a blacksmith shop, and a post office which served a community of 100. 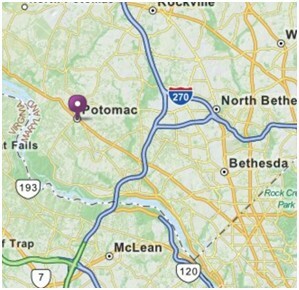 Offutts Crossroads was renamed Potomac in 1881 by John McDonald. An Irishman and veteran of the Civil War, McDonald settled in Potomac around that time. He petitioned for the name change since postal officials were asking for brief names and there were already several other communities in the area with the name "crossroads".